WordPress website promoting photography services; extensive blog with backstories and favorite photos. Beaver Builder theme, content copy protection, Slider Revolution plugin for photo/testimonial sliders, Instagram slider, iThemes Security Pro with Two Factor Authentication, All in One SEO, Clicky analytics. 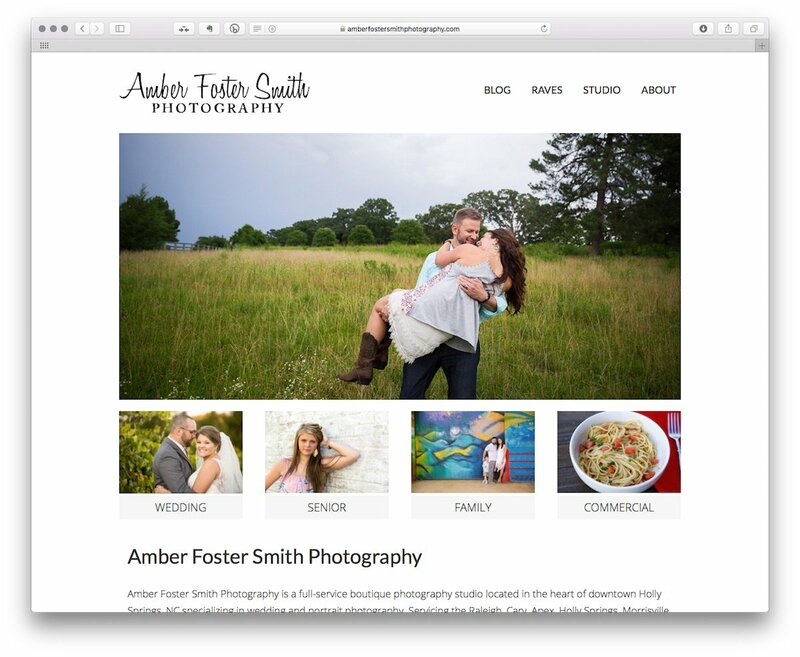 Amber Foster Smith Photography (AFSP) is a full service photography & branding company located in downtown Holly Springs, North Carolina. AFSP had an existing WordPress website but faced three major problems. First, the WordPress theme used on the site limited the owner's ability to creatively showcase AFSP work. Second, the site did not allow AFSP to segment the site for major types of work (Weddings, Seniors, Families, and Commercial). Third, the WordPress theme was being discontinued and no longer supported. A custom, segmented design was used for the new site so that a visitor interested only in a specific type of AFSP's work (for example - weddings) was exposed to only those pages. This effectively gives the feel of four focused websites, but with the ease of managing only a single site. PhpStorm, Chrome Developer Tools, custom code (PHP/JS/jQuery/HTML5, CSS3), WordPress, Beaver Builder Theme, Beaver Themer, Beaver Builder Pro, Ultimate Addon for Beaver Builder, All in One SEO Pack Pro, BackupBuddy, Clicky Analytics, Instagram Feed, iThemes Security Pro, iThemes Sync, Slider Revolution, WP Content Copy Protection & No Right Click. Segmenting the site was achieved by creatively using WordPress menus, categories, and custom PHP code. The home page presents a unified view of AFSP, but also presents a prominent graphical navigation bar allowing the visitor to choose between four topic areas: Wedding, Senior, Family, and Commercial. To compress a large number of featured photographs into a small page footprint, the Slider Revolution plugin was used. Offering an unbelievable number of configuration options, the plugin was tailored to showcase some of AFSP's best work. The previous AFSP website did not use https (see Why HTTPS Matters to understand why making the switch from http to https is becoming more important). Using Let's Encrypt certificates (Siteground makes these available with every account), the new site was implemented using Secure HTTP. The site is also strongly secured using the iThemes Security Pro plugin. Two factor authentication ensures only authorized individuals are allowed to edit site content. Using this plugin along with an extensive security configuration has successfully defended the site against malicious hacking attempts. Easy to understand, yet detailed traffic tracking is performed by Clicky. Using the BackupBuddy plugin, automated backups are created and pushed off to Amazon S3 storage weekly. AFSP has _lots_ of photographs on the site and the backups are very large (2.5 GB for a full backup). This backup solution easily handles the large amount of data. I can not speak highly enough about the work that Doug did to bring the vision for a new AFSP site to fruition. Our old site was a great starter website but as our company has evolved and changed so have our needs. Serving several very different client types for the different branches of our business created a unique need. Our goal was to have all of our clients come to one site but still be able to receive a custom experience. With our new site when clients arrive to the homepage they have a clear call to action to select the type of service that they need. Once they select their category they are directed to a new homepage where the menu bar and all features are catered specifically for their needs. 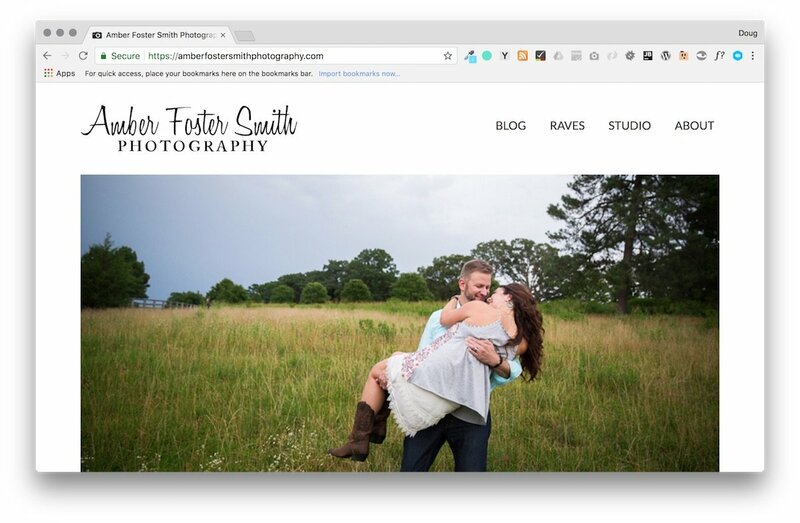 Now our wedding clients do not have to be bothered viewing details about family sessions or blog posts about our commercial clients. They receive a unique experience where we can guide them through the content that they find relevant and exactly what they are looking for, no more, no less. Working one-on-one with Doug was a great experience. His expertise and his passion for his work showed though each step of the process. I approached him with a far-fetched and to be honest, very complicated concept. He immediately said he could bring the vision to life and the product he delivered is flawless. I have worked with WordPress in the past so I had a general knowledge but he was very patient with me and explained many of the options of features we could incorporate. He took the time to not only share with me the plugins and other elements he felt were necessary but why they were important as well as how they worked. Doug kept in mind my budget and was realistic about the scope of work needed. In the end he delivered a website that was exactly what I had envisioned from a design perspective but then made it functional and easy for us to maintain on our own as well. I without a doubt would recommend Doug to any business who is looking for anything from a complete custom site or just a refresh. The investment of a custom website for your business is absolutely necessary. It will help to create a strong brand identity for your company and Doug is exactly the one you want to create it for you.